On a chilly evening this past December, the bar at the Temple House hotel in Chengdu was transformed, rather convincingly, into a scene out of Game of Thrones. Perched under the wings of an imposing papier mache dragon, sipping a gin cocktail served in a medieval-style goblet, and surrounded by waitstaff flitting about in hooded capes, I had to keep reminding myself this was not Westeros, but rather the capital of Sichuan Province, in China's southwest. 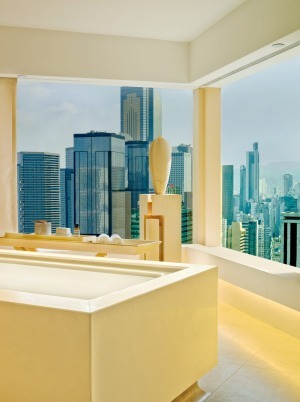 The Temple House, one of four properties in the Swire Group's House Collective, is no ordinary hotel. "The brand was conceived with the view that there was an opportunity in the market for smaller, distinctive, unconventional luxury," says Toby Young, managing director of the Collective, on the phone from Hong Kong where he is based. "Unlike every other luxury hotel brand we don't have standard operating procedures." Young says there is no "script" for interactions between staff and guests at the Houses. Certainly, the Temple House is the most unique hotel I've ever stayed in. From that Game of Thrones theme night at the hotel bar – a passion project of the hotel's ebullient Austrian general manager, Kurt Macher – to its location within an ancient monastery complex, the 100-room hotel is full of surprises. Although it looks brand new, the Temple House has been open since 2015. Until recently, it was the newest addition to the House Collective, joining Beijing's Opposite House, which opened in 2008 ahead of the Olympics, and Hong Kong's Upper House, which opened in 2009. In May of this year, Swire, a British real estate company which also owns Cathay Pacific, added a fourth property to the portfolio, the Middle House, in Shanghai. Before I toured the original three hotels late last year, I hadn't heard of the House Collective. It's not a big, well-known chain of the kind that dominate Asia. For one, each hotel is different from the last. Although Swire could have easily cashed in on the ever-more competitive Chinese market by opening a series of swish but anonymous five-star operations, it went instead for imagination. Flair, even. Two factors which contribute to the House Collective's success are the relatively small size of the hotels – about 100 rooms – and their location within mixed-use developments. "That's a key part of our placemaking strategy," says Young when I ask him about it. "Hotels add value, and we benefit from the footfall of those developments for our restaurants and bars." Swire is a powerful player in Chinese commercial real estate, and its hotels are reliably situated in the most desirable areas. In Shanghai, finding the right site for the House took "several years," Young says. Ultimately Swire settled on a location near the fashionable Nanjing Road West, also part of a shopping development. To bring calm to the 111-room property, the architect Pierro Lissoni designed a building with an abundance of terraces shaded by round aluminum louvres. "I am Italian," he says by way of explanation when I ask him about this unusual design feature. "I like the idea of the piazza, the small square. In the end, Shanghai is not such a green town." So, Lissoni says, he wanted to use outdoor space to create "something a little bit more silent, elegant, modernist. I didn't try to be Chinese, because I'm not." 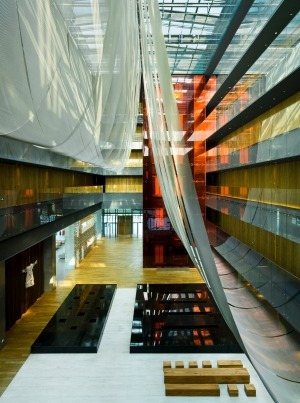 Still, Lissoni adds, he sought to bring elements of Shanghai's cosmopolitan past into the hotel. Antique ceramics, tiles and stone contribute a sense of place and, as with the other Houses, contemporary artwork is scattered throughout the hotel. When I visited the Opposite House, a giant industrial-chic Christmas tree rendered by a local artist dominated the lobby. It was memorable, and a little confronting, to gaze at the wire structure while devouring a smoothie bowl in the hotel's ground floor restaurant. Perhaps it was simply not to my taste. "The emphasis we place on design attracts a less mainstream customer," Young says. He lists media, fashion and tech as industries which make up a big part of the House Collective clientele, and cites a Chanel fashion show at the Temple House as an example of how the hotels are "synergistic environments" for creative people. One potential pitfall of a design-heavy approach is that it can date quickly. While the carpets at the Upper House are showing some sign of wear, all is forgiven when you gaze out the huge windows onto the lush hills behind the city. Legendary architect and lifestyle guru Andre Fu's vision of relaxed elegance is evident in the smallest of details, even the tranquil chime of the elevator, which a staff member tells me Fu specifically requested for its soothing properties. The size of the rooms, which are former private apartments, helps too. How often do you get to enjoy a corridor in your hotel room? Unfortunately, though, the Opposite House is showing its age. The design, by Japanese architect Kengo Kuma, probably read as strikingly contemporary 10 years ago. Today, the minimalist rooms come off as austere. The lack of a proper wall between the bathroom and the bedroom, for example, might have once been edgy, but is now annoying. At Chengdu's Temple House, only three years old, everything is still exquisite. 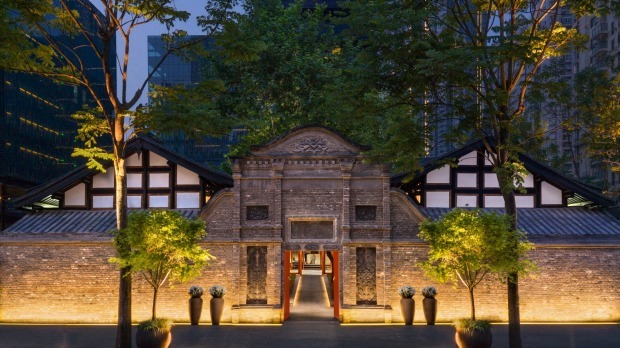 The entrance is through a 100-year-old Qing dynasty courtyard with preserved wood panelling. Bronze cage lights illuminate a gallery on the left and a library on the right. Rooms feature bleached oak floors, yak-wool throws (move over, merino) and bathrooms with latticed woodwork. The structure, designed by MAKE Architects, is so discreet as to be almost mysterious; little lanes between wings evoke Chengdu's old town streets, known as Wide and Narrow Alleys, and tiered green spaces reference Sichuan's landscape. As at other House hotels, the restaurant on site, a cheerful Italian joint, is not necessarily a destination in itself. (The exception among the Collective is the splendid Peking duck at the Opposite House's Jing Yaa Tang, which attracts a savvy expat crowd.) Instead, you're aware of the hotel's strategic location, and staff enthusiastically encourage guests to explore nearby hotspots. Both the Hong Kong and Shanghai Houses feature Cafe Grey, the serviceable pan-European restaurant concept from New York-based Gray Kunz. That there's no buffet breakfast at any of the properties could be seen by some as an inconvenience, or, alternately, as another sign of the Collective's aversion to tired luxury hotel tropes. Either way, the panorama from the Upper House's Cafe Grey, on the 50th floor overlooking the harbour, is indisputably magnificent. Add a strong coffee – they'll remember your order from yesterday – and the Financial Times delivered to the table, and it's a wonderful start to Hong Kong adventuring. When I ate there recently, the roughly equal numbers of excited tourists and jaded business people in the dining room seemed to agree. What sets the House Collective apart, ultimately, is its imagination. "We want to create something that's distinctively different, which is not always easy these days," Young says at the end of our call. "We maintain that individuality not just in the design and naming, but with a style of service which is authentic and memorable." Authentic and memorable may be buzzwords in the hospitality industry right now – which Young concedes – but for the most part, the House Collective delivers on that promise, capes and all. All prices are based on best available for double occupancy. Amelia Lester travelled to Beijing, Hong Kong and Chengdu as a guest of the House Collective.